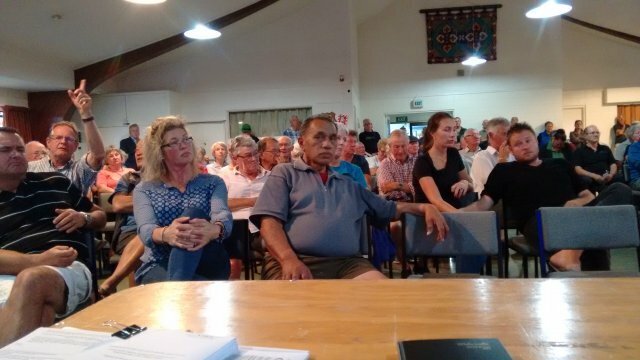 The major event this week was last nights (14th March, 6.00 -8.00pm) public meeting organised by The Advocates For The Tongariro River about the proposed Carp Farm in Taupo. 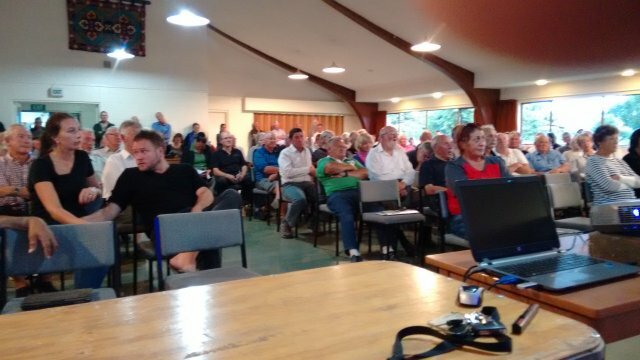 The meeting attracted some 175 Taupo district residents and was chaired by our Deputy President, Warren Butterworth. Paul Decker Of Mahurangi Technical Institute (MTI), Warkworth showed photos of the two species, Grass carp and Silver Carp and gave a brief background of the species. He took pains to state that they were not Koi Carp, an acknowledged pest fish, and not Common Carp, the costly problem fish found in Australia. Richard Clark of Golden Harvest was given the opportunity to explain the farm operation before the meeting was opened to questions from the floor. Richard’s website is http://rclark30.wix.com/goldenharvest and covers the points he made in his introductory speech. The key point in the questions was that of risk – that these species could get into Lake Taupo and into the Waikato River. Richard Clark, Paul Decker and Dr Tagried Kurwei stated that if they did neither species could breed and establish feral populations. The special breeding conditions of water temperature, eggs had to be carried in the water and could not touch the bottom, and the time needed for the eggs to hatch being temperature dependent made this impossible. This was countered by Professor Brendan Hicks of Waikato University (Lake Ecosystem Restoration New Zealand, Invasive Fish Control) who attended the meeting. He had reservations about the inability of these fish species breeding in the Waikato River. Professor Hicks view was supported by the meeting. Iwi at the meeting said that Ngati Tuwharetoa had not been consulted. Richard stated that he was working on this. Consultation had been held with Ngati Tuwharetoa Maori Trust Board but consultation was still to be held with Iwi of Ngati Tuwharetoa. Golden Harvest Aquaculture was a Limited Liability Company and as such would not be responsible if the company failed and fish escaped. Was the value of the Taupo Fishery, a world class fishery known throughout the world, with a value of $90,000,000 worth being risked for a carp farm of lesser value. The issue of fish disease was raised as carp overseas carried fungus which could be carried by carp and could affect other species. Paul Decker and Dr Kurwei denied that grass and silver carp bred at MTI carried fungus. John Ooi, a NZ resident of Chinese origin, questioned the research for grass carp and silver carp as being in demand by NZ Chinese as the many Chinese in China who ate these species did so because of the lack of alternative desirable fish. It was ” poor mans” food. Chinese in NZ were wealthier and the preferred species for them was Blue Cod. He questioned what would happen to surplus fish not sold. the carriage of fish put our waters at risk. Carp would be transported as fry from Warkworth to Taupo and then back to Auckland as mature fish for the Auckland market. Paul Decker responded that you could buy goldfish from a pet shop and take them home in a plastic bag. The law allowed that. NZ law was lax in that respect. No one from the audience spoke in favour of the Carp Farm. Meet with the Taupo hapu where the proposed Carp Farm is to be located, for their approval. We can be very proud of the job done by the Chairman, Warren Butterworth, who had to deal with an involved audience and he handled the audience with calmness and fairness. This meeting RESOLVES that the Ministers of Primary Industries (Mr Nathan Guy) and Conservation (Ms Maggie Barry) and any other Government Departmental Heads concerned in carp farming BE ADVISED that it strongly opposes the establishment of a grass and silver carp aquatic farm in the Taupo District and that the Taupo District Council and Waikato Regional Council be asked to advocate its opposition to any such ventures on behalf of this meeting’s attendees and on behalf of other concerned residents and ratepayers AND that hapu of the District be consulted and informed by Council in respect of such projects. The Resolution was passed by an overwhelming majority – there were several abstentions. Interest in the meeting was expressed by apologies received from our local MP the Hon Louise Upston, Paula Southgate (Chair of Waikato Regional Council) and apologies from WRC Counsellors Peter Buckley, Tipa Mahuta and Timoti Bramley, also from Jeffrey Bennett, Professor David Hamilton and Michel Dedual. The TDC Mayor David Trewavas and Counsellors John Boddy, Bernhard Chrustowski, Rosanne Jollands, John Williamson, Zane Cozens, Waikato Regional Counsellor Kathy White attended. I conclude that the meeting was successful in that the people of the Taupo district have had their first opportunity to hear from the applicant and to question the applicant.